Note: The following predictions are not necessarily reflective of those in The TV Ratings Guide's Renew/Cancel columns. The Big Bang Theory -- A Nielsen juggernaut after 10 seasons, TBBT re-signed for an additional two years of laughter in the way of high Nielsen rent delivery increasing its neighborhood's market Nielsen expectations. The lessee is a model tenant delivering its Nielsen rent on time, and negotiations came down to the wire in demanded amenities such as licensing fees and salaries. After referring new tenant/freshman pilot Sheldon to rent space in the fall, CBS gladly accepted the terms to their new lease under the caveat of both parties compromising demands. 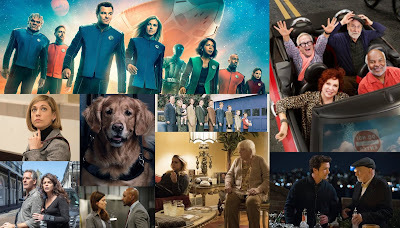 Nielsen deliveries have eroded, yet TBBT remains one of the three top-scripted performers in the network landscape, vying with dramatic masterpieces This is Us and Empire. Kevin Can Wait -- CBS Mondays pale in comparison to Thursday Nielsen market values, and KCW leads the evening with a season average of 1.70. Five showings utilized lead-in credit from TBBT to build, and the investment was wise. KCW always raises the bar among its three sitcom neighbors and formed the block trend of catering to male-centric interests. Since the Sitcom Scorecard's inception, KCW was predicted as a positive gain in a renewed contract. Mom -- Shows not named "The Big Bang Theory" on Thursday evenings always deliver average Nielsen market values. Mom renewed for a 5th term as it breaks CBS Property Management's trend of the 8pm showing rating as the highest rent, trending down to the less-desirable 9:30 space for rent. In recent weeks, Mom matched or outperformed its lead-in's disappointing delivery. Like KCW, renewal was predicted at 100-percent at Scorecard inception. Life in Pieces -- The sophomore tenant stifled speculation of moving out of CBS' building after "Sheldon" was announced as a prequel to TBBT. It previously rested at a 70% likely renewal of its lease and proudly remains on CBS' grounds. Life in Pieces narrowly dodged delivering fractional Nielsen rents this season, yet they are a tidy renter. They do not partake in synthetic vices on their patios such as canned laughter, and also reside in less-desirable real estate overlooking the 10pm Drama Dumpster on Thursdays. Man With a Plan -- KCW's Monday neighbor delivers blue-collar rents and enjoys vices such as canned laughter and cheap jokes/spirits, yet its curb appeal resides in being an excellent neighbor. Property Manager CBS silently seeks appealing men to attract new viewers on Mondays while carefully avoiding discrimination via the Fair Housing Act of 1968. Prior risk calculations in the Sitcom Scorecard remained a 90-percent/Likely Renewal renewal predictions. Superior Donuts -- CBS' midseason entry has 8 episodes of credit history with only one usage of TBBT lead-in credit. The remaining seven episodes delivered Nielsen rents in the range of 1.4-1.0, with a credit score/season average of 1.30. Ranked as a 70-percent Likely Renewal, Donuts' evaded a credit ding due to an anemic 1.0 Nielsen delivery on 3/20. Credit score factors working in Superior Donuts' favor are its youthful age, diverse tenants, renting in a CBS credit-friendly production studio, performing with the 9pm Nielsen market and compatibility with the 8pm hour ocupants. Four Network Property Management teams seek to lease a diverse offering of market value Nielsen rents. CBS furnishes 8 spaces, with six committed leases and two vacancies with a median Nielsen market rent of 1.58. 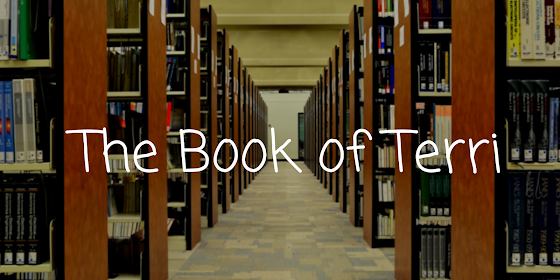 Subtracting the premium TBBT-leased space, that market value reduces to a 1.37 demo. ABC offers 10 spaces of diverse market Nielsen rent expectations. Wednesdays are high-rent Demos in Demand, with all occupants' Nielsen rents delivering between 1.58-2.19 in Demo deliveries. Tuesdays offer similar demo rents in two openings at 8pm, while offering affordable demos in the 9pm hour ranging from 0.93-1.22. And Fridays offer affordable housing for lower-rent Demo deliveries on par with Tuesdays at 9pm. 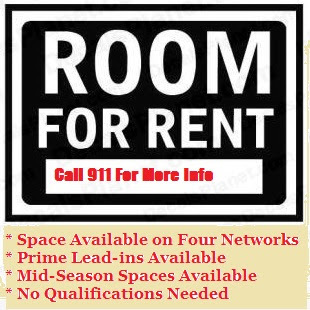 10 spaces are available for lease with only The Middle renewed. It median Nielsen market value is 1.45, while tying CBS' median 1.37 subtracting its highest rents. FOX offers 7 spaces for rent and has 9 existing sitcom lessees. Of those 9 applicants, 3 are committed to leases. A scarcity of real estate is mitigated as FOX offers short-term leases of 9-18 episode orders. Its median Nielsen Market value is 1.17, reducing to a 1.07 median subtracting its highest rent. NBC has the fewest spaces offered among their serious premium rent dramas, opening 2 units on Thursday at 8pm to remain trendy with allowing affordable sitcoms to coexist in its upscale environment. Its market-value Nielsen rate is 1.14, yet it matches FOX's 1.07 median subtracting its highest rent. FOX and NBC Nielsen rents are lower, yet they lease spaces for special events. NBC leases dramatically-owned Tuesdays during off-season months when This is Us rents their posh dwelling via Air B&B to Mid-Season visitors with 9-13 episode stays behind high-rent The Voice. And Fox offers sporting event premiums to its Sunday lineup, adjusting rents accordingly. Recent drops in Nielsen Market Values among the four Network Property Management teams leads speculation to drops in minimal Nielsen rents, as well as Property Management opening available spaces to rent where Nielsen fails to collect reliable rents. FOX's existing Tuesday tenants Scream Queens and exiting Bones are opening discussions for leasing the 9pm hour to two sitcoms. Rents will be paid in fractions, no doubt, but the sitcoms delivered higher Nielsen fractions than several dramas renting 60 minute spaces. NBC is pleased with its diverse risk of low-rated sitcoms after previously banning sitcoms from renting long-term Nielsen leases in competitive timeslots. Reliable Nielsen rent delivery from Superstore and The Good Place has property management questioning if it may return a consistent profit allowing sitcoms to rent another two schedule spaces. After disastrous evictions of freeloading sitcoms such as Sean Saves the World and The Michael J. Fox show, NBC raised minimum rent qualifications for sitcoms, demanding they remain in the cosigning of high-rent The Voice and never earn a full 22-episode/one year lease. The Good Place and Superstore's positive credit history with Nielsen rents has raised faith and has NBC catering to a broad diversity of economic classes. 80-percent of ABC's sitcoms tenants are reliable Nielsen Rent paying clientele. Only two of its current tenants have delivered rent in fractions in the last 12 months, one of which has an affordable rent timeslot on Friday evening. Several ABC dramas are slated for eviction for consistently paying Nielsen rents in low fractions, leaving their Property Management team to question whether another two 30-minute spaces may be available on Sunday or Friday evenings next fall. ABC's sitcoms lack diversity in premise, focusing on family hijinks. However, most consistently feed their network its Nielsen rents to keep the property alive. ABC dominates the Credit Check application with 5 solid tenants -- The Goldberg's, Speechless, The Middle, Blackish and Fresh Off the Boat. All applicants pay premium Wednesday Nielsen rents expecting 1.5 rents or higher or keep vacancies minimal on average Tuesdays. FOX has popular renter Family Guy with seasons of high-Nielsen Glory amidst fractional Sunday Nielsen dwellers. All applicants are demanded and sought renewals. Both applicants in this Nielsen Credit Score category are housed by ABC. Modern Family has delivered premium Nielsen rent returns during its 8-year lease. It is a welcome renewal, under the caveat it returns its premium amenities. Once delivering high Nielsen profits, it has dipped A+ credit classification above a 2.0 Nielsen rating on odd evenings to a standard grade classification. If its lease is renewed, it must relinquish its premium gym membership (high salaries), as well as periodic use of the grounds via commercial promotion. Last Man Standing often leads its low-rent evening in Nielsen delivery, yet houses aged star Tim Allen's perks (salary). Last Man Standing is known for waiting until the last available moment for lease renewal, increasing its risk score for non-renewal. It rests in the delta of the Nielsen's Middle of the Pack, yet has always paid its Nielsen rent in whole vs. fractions. 5 Applicants reside in this credit category, applying for lease renewals at ABC, FOX and NBC. Reduction in lease applicants from 28 to 22 forced the need to eliminate the previous 80% positive risk category, downgrading Last Man on Earth by 10%. Recent post-NFL rent delivery dropped below the 1.0 rent line. 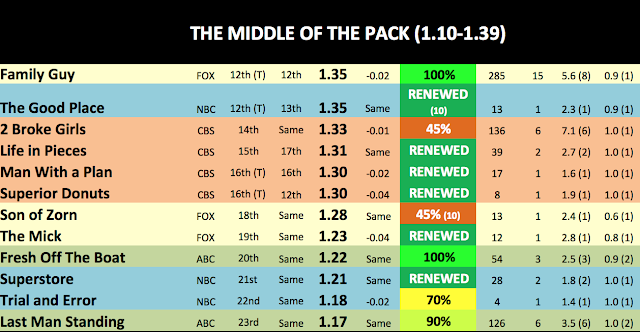 Sunday Football timeshares run at a premium, and Last Man on Earth took the less-desired/affordable 9:30 timeslot. LMOE has 42 episodes of Nielsen rent history vs. freshman comedies' 3-13 uneven financial status. If LMOE continues to deliver Nielsen rents at a 0.8 Demo or higher, it will upgrade in credit score value. Fellow FOX lessees/spplicants New Girl and Brooklyn 99 reside in close Nielsen credit score ranges between 0.93-1.02. LMOE presents a higher renewal option as New Girl and B99 have 80-135 episodes of credit history and will be assessed by which show costs the least overhead for FOX Property Management to lease vs. diminished Nielsen returns. New timeshare lessee Trial and Error has minimal credit history of four episodes of Nielsen history, yet rates close to renewed lessee Superstore. 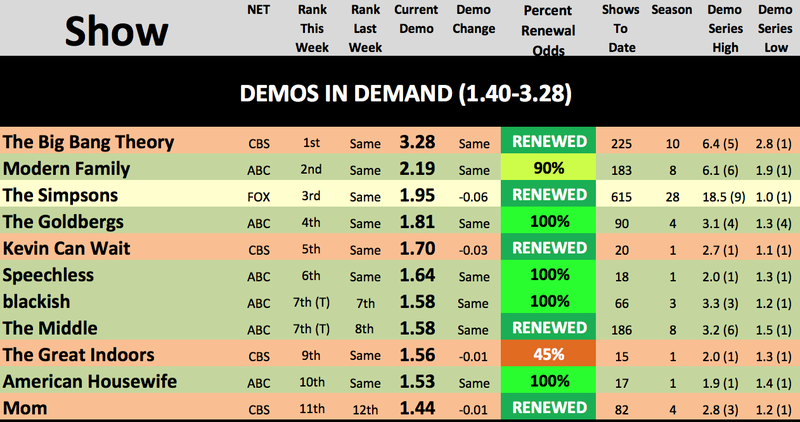 An encore episode on Thursdays improved performances over delinquent Powerless, and NBC demonstrates flexible Nielsen payment options on shorter leases. Its risk proposition is promising under the caveat it remains above the 1.0 Nielsen rent line. And Dr. Ken received an upgrade by default as the 55% credit category was eliminated. Its credit history is poor among its 40 episode history, delivering a 0.88 Nielsen median for the season. However, Dr. Ken rents the least-desirable space among all four property management teams on Fridays at 9:30. It is frequently affected by plumbing runoff from LMS, and seems to be its one neighbor who tolerated Tim Allen's larger than life personality. Previous tenants Cristela, Malibu Country and The Neighbors deliberately defaulted on Nielsen payments to escape the rundown space, while Dr. Ken fits into the surroundings. Dr. Ken's renewal is hinging on the renewal of its neighbor, as faith in prompt Nielsen payment is tenuous at best. And it is the only neighbor who enjoys a common wall with LMS. Elimination of 6 sitcom lessees, coupled with recent renewals led to an increase in this undesirable credit category. CBS and FOX's possession of a combined 9 lease renewals led to a drop in score for The Great Indoors as well as a credit entry for Making History. 2 Broke Girls and Son of Zorn scored in this range. This week's only change in their status is they now have competition on their own network. 2 Broke Girls has 136 episodes of rent history scattered over 11 moves, and the quality reflects in a recent 1.0 Nielsen delivery. It is not a preferred CBS-brand renter and faces stiff competition. CBS spoke up against the show's excessive and previously tolerated vices such as overt sexuality, canned laughter and prolific marijuana use. Joining CBS' undesirable tenant list is The Great Indoors, who cheapened prime TBBT space for rent with less than half of its Nielsen deliveries and impacting the trend of viewers. Property Management expected more from upscale Joel McHale and his visually-appealing costars, believing his high-dollar delivery would attract other upscale lessees. This was not the case as his value diminished the Thursday block value. Initially an 80% positive credit factor, TGI's score reduced to a 45% return, as it must demonstrate positive Nielsen rent deliveries by 3/28 at 9:30pm after Superior Donuts. CBS has these diverse renters pitted against each other should their Property Management team decide their presence is welcome on their grounds next fall. Similar to CBS, FOX Property Management has given written notice to Anemic tenants ZORN and MH, letting them know they are in direct competition for lease renewal. ZORN delivered sporting-event priced rents during football season, albeit to paltry results. It also delivered a record delinquency of a 0.6 fractional Nielsen payment, the lowest among the four Property Management teams of all time. Its short lease opened the space for MH to establish Nielsen credit history, with little improvement. Three episode histories leave a 0.77 average, the lowest Nielsen rent delivery of the season to date. Both shows run limited leases, yet are forecasting a high-risk for poor Nielsen delivery, even for FOX's low median rents. Both applicants have rented on shorter leases over multiple seasons with delinquent Nielsen histories. Both rent cheap timeslots in premium CBS and ABC properties and delivered Nielsen rents below their lowest standards. The Odd Couple had a nomadic history, renting odd spaces and giving CBS its lowest sitcom Nielsen rent delivery to date with a 0.9. The Real O'Neal's was granted a hardship renewal this season as ABC Property Management's market Nielsen rents dropped and additional sitcom spaces were allotted in failed 60-minute dramatic rentals. Fellow low-rent neighbor Fresh Off The Boat took to the move well, improving the previous tenant's performance while TRON failed to generate positive Nielsen payment history. It resides in ABC's less-desired timeslot overlooking the 10pm Drama Dumpster and continues to unload garbage ratings onto its neighbor. Tuesdays at 10pm is known for being ABC's dumpster location for weak or unwanted shows, yet TRON joins in their failure. Unless ABC plans on granting TRON a hardship lease to launch a new sitcom space for rent, it will be the first candidate when ABC hands out its eviction notices by May 13. And TOC only stands for a lease renewal on CBS for unwanted timeslot spaces, or if CBS All Access opens up an alternative housing project for this sitcom. NBC property Management has too many high-rent comedic and dramatic Nielsen renters to grant Powerless a Stay of Eviction. Given it has limited options for tenants, NBC is collecting its fractional rents until a suitable renter to deliver higher demos. Its 0.7 demo is a staunch reminder to the network to beware of risky renters and advise via Nielsen credit checks. No credit history has been established for ABC's Imaginary Mary or NBC's Great News. Imaginary Mary delivers its first Nielsen history on 3/29, likely on borrowed credit from gold card The Goldbergs and Platinum card holder Modern Family. Great News is slated for reports on 4/25. Until then, keep credit reports up to date to evaluate risks and Nielsen prospects for the remaining 20 applicants. Lease renewals are a combination of numerical and behavioral factors. The 2017-18 season validated the Nielsen Credit Report's validity, as well as a continued need for credit risks with additional sitcom timeslots to rent. Positive references from critics deliver a limited weight in this credit report, and high Nielsen deliveries such as The Great Indoor's median rent delivery do not guarantee lease renewals. Property Management knows schedule spaces may increase in value with new tenants, so renewal and termination of contracts is inevitable for networks to manage their business.